“Why’d they allow a Chick-fil-A at the airport in the first place if the owners’ view of gay rights bothers them so much?” you ask. Good question. Answer: It doesn’t bother them that much. Not enough, at least, for city officials to have noticed Chick-fil-A’s inclusion on a list of restaurants seeking permission to open a franchise at the airport. That list was approved last year, before someone reminded those officials that a city like San Jose is supposed to hate Chick-fil-A in the name of Progress. We “simply didn’t think enough” about the politics of it, said the mayor afterward apologetically, inadvertently reminding everyone how few people care about this. But amends had to be made. So Plan B is to festoon the airport, especially Chick-fil-A’s neck of it, with LGBT rainbow flags. If you’re one of the 0.00001 percent of hungry, harried airline passengers who has a strong opinion about being in general proximity to a Christian chicken eatery, rest easy knowing there’ll be symbolic reassurances nearby that the city of San Jose stands with you. “I made the suggestion to put the flags next to the restaurant, and council members liked that idea but also said that maybe put flags elsewhere, too, like outside,” [councilman Ken] Yeager said. The question of where exactly to put the flags is a thorny one. My favorite take from the city council meeting came from one member who warned that “if we have them next to Chick-fil-A, it might be confusing—people might think Chick-fil-A is supporting [gays] and go to that restaurant.” Other members loved the idea of hanging flags nearby, making it “the gayest Chick-fil-A in the country.” A writer at Eater who’s excited about the plan encourages readers to “Think of all the Instagram photos of this Chick-fil-A that might have LGBTQ pride iconography in the background.” Indeed. What better way to pwn a business you hate than to give consumers extra reasons to congregate there? According to Yeager, it’s important to have the flags on display to show visitors that they’ve arrived in “an inclusive city.” Remember which city we’re talking about here — San Jose, de facto capital of Silicon Valley, a place with a Democratic mayor and exactly one Republican on an 11-member city council, third-largest metropolis in a state so blue that Republicans frequently don’t even qualify for general elections anymore. Yeager’s ostensibly worried that visitors might disembark, spot one of the country’s most ubiquitous fast-food joints, and conclude that the locals must hate gays. 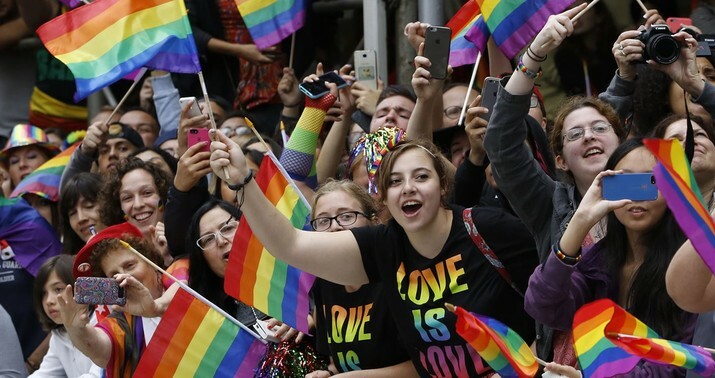 Have you ever traveled to a major city anywhere in the United States and questioned for an instant what the local government’s political lean is, particularly on cultural issues like gay rights? Maybe only if you’re in Texas, right? The same councilmember who wanted to make this the gayest Chick-fil-A in America also proposed adding a rule that would prevent the city from extending the airport contracts for any business that isn’t open seven days a week. That’s revealing, as CFA is famously closed on Sundays to give employees a day off to worship (or just to rest). The seven-day rule seems designed to give the local a government a sham “neutral” excuse to target the company for its owners’ religious views, presumably on the theory that since airport retail space is limited and passengers need service 24/7, contracts should only be awarded to companies that are open ’round-the-clock. They’re straining for ways to punish traditionalist Christians legally and barely disguising their motives, which has been risky for them in the recent past and might be again. Reading about this, you might never guess that the public debate over gay marriage was one of the fastest and most resounding cultural victories for the left in U.S. history, lasting little more than a decade from the time SSM was first talked about semi-seriously as policy to coast-to-coast gay marriage becoming the court-ordered law of the land. Prop 8 passed in California on the day Barack Obama was elected president; the Obergefell decision came down before he left office. Legalized gay marriage now enjoys two-thirds support in public opinion polls. Social conservatives like to say of the left’s ongoing culture war over gay rights that they’ve already won and are now roaming the battlefield shooting the wounded, but insisting on something as petty as hanging LGBT flags near a Chick-fil-A reeks of insecurity. Take the W, city council.